Karlie Kloss is the new host of Project Runway so naturally she was on hand for Bravo`s Top Chef & Project Runway Event yesterday evening(April 16th) at Vibiana in LA. While Karlie has had some great red carpet looks, I was totally taken in by her look for this event. 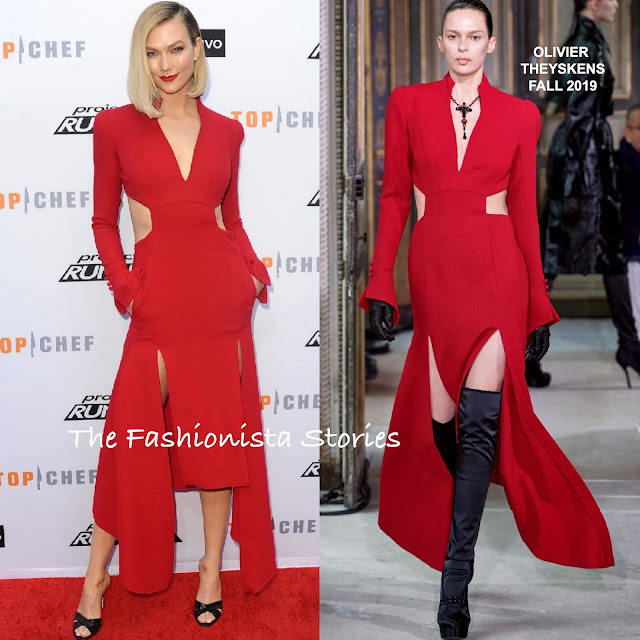 She worked a sultry OLIVIER THEYSKENS FALL 2019 red cutout, double split v-neck dress, with side pockets which she utilized. Love the color and while that uneven hem is odd, she sells it. Also the matching red lip put the icing on the cake for the win. A side parted bob and black GIUSEPPE ZANOTTI mule sandals rounded out her look.